The death of a baby is recognised as one of the most difficult bereavements that has a life-long impact for families. Each year our local Cork University Maternity Hospital hosts an ecumenical Service of Remembrance where parents gather with staff to remember and honour their baby. The 2013 service will take place on Friday 11 October at 7pm at the Sacred Heart Church, Western Road, Cork and will be followed by refreshments. The death of a baby before or after birth is a devastating experience for parents and family members. 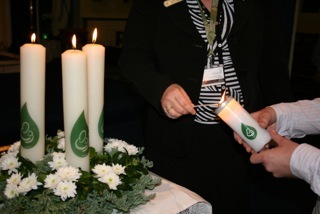 Our multi-denominational Service of Remembrance is an important part of our ongoing care and support when we as a hospital community gather with parents and families to remember your baby, to offer support and to comfort one-another during what is a very gentle and moving ceremony. During the service of readings and music there will be an opportunity to light a candle in memory of your baby, write an inscription in our Book of Remembrance and to spend some reflective time with others who share in your journey. Pregnancy loss has considerable impact on parents, physically, emotionally and spiritually, altering their health and social wellbeing, and also carries implications for the woman’s long-term health and future pregnancies. Our annual Service of Remembrance is an important and supportive experience for parents and families on their journey of bereavement. All who have experienced the loss of a pregnancy or the death of a baby are invited to attend. This entry was posted in Chaplaincies, Church in Society, Church Services, Pastoral, People in Need. Bookmark the permalink.